Synergy Spanish is a unique course that uses something called the “80/20” rule. Perhaps you have heard of it. The rule states that in any field of human endeavor 20% of the effort brings 80% of the results. This is sometimes referred to as the Pareto Principle. It’s an interesting concept and one of the reasons I was excited to write this Synergy Spanish review. In the course, students work through 68 structured audio lessons with the aid of a guidebook. Each lesson is about 10 or 15 minutes long. In these lessons students learn 138 “brick,” “mortar” and “synergy” words used to make 88,000 potential Spanish sentences. The system eliminates a lot of tedious grammar and is good for people who hate traditional grammar exercises and want to learn basic Spanish fast. It is really designed for people who want a shortcut to learning survival Spanish or enough Spanish to get by in many practical situations. The teaching method is not a gimmick. In fact, it’s surprisingly effective. Each lesson builds on the previous lesson while the guidebook explains the Synergy language system that simplifies language learning. The best way to get a feel for the Synergy method is to take their free test drive. After puchasing the download version of the product, you get immediate access to the Synergy members site where you can access and download the audio lessons and the step-by-step action guide. You can play the audio files on your computer, burn them to CD or transfer them to a portable device like an MP3 player or iPod. If you choose the home delivery version instead of the download, you will receive a set of 14 CDs in the mail that you can play on your computer or in your CD player. Both versions include the same lessons and 90 days of email support. The course has been around for a while. In fact, I first wrote this Synergy Spanish review back in 2008 and have heard plenty of positive feedback over the years. • 68 audio lessons, each about 10 or 15 minutes long. • Action guide that leads you through the lessons and explains the Synergy system. Both versions contain the same course materials. Synergy Spanish offers a free “test drive” that includes the first four chapters of the course. • Easy audio course for beginners. 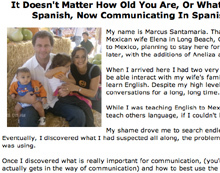 • Good for people who hate traditional grammar exercises and want to learn basic Spanish fast. • Unique teaching system uses the “80/20 principle” to simplify learning. • Download version sells for about $67.